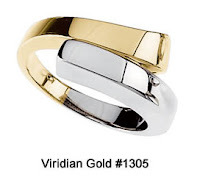 Most of the gold jewelry items we carry at Virdian Gold are 14K gold, and many are available in either yellow or white gold. One of the calls I took today was a customer asking if our Two Tone Bypass Ring, #1305, was available in 18K gold. I checked with our supplier, and indeed it is available in 18K, but it would be a custom item, and would likely cost about double the 14K version! Needless to say, the caller was not interested! So, what is the difference in 14K and 18K, anyway? As described in an earlier post, it has to do with the gold-alloy mix. So, 18K is 75% gold, and 14K is 59% gold. 14K is stronger and less easily scratched because of this. Both types of gold appear as yellow (for yellow gold), though, so why pay more for 18K? There really is no reason, except that 18K is perceived as higher quality by some folks, because it has more gold content. But, what a waste of money when you cannot tell the difference! White gold, for instance, is more difficult to obtain for 18K, because the alloys have to be "stronger" in white color to overcome the yellowness of the gold. And, even then, natural 14K white is "whiter" than natural 18K white. I say "natural", because both white gold jewelry items will be plated with rhodium--they will look and wear exactly the same! The only difference is that the 18K will cost much more. To be fair, some people believe that 18K yellow gold is more "yellow" than 14K yellow gold, but that really depends on the lighting and on the actual alloy that each item contains. Bottom line--it is more about perception and personal preference. That's why Viridian Gold carries mostly 14K gold items--it is the best value for your money. But, the quality of our jewelry is superior to many other stores' 18K jewelry. And, we do make a few of our items available in 18K gold on our website (such as our 6mm Gold Lightweight Omega Chain). So remember, when you are buying gold jewelry, 18K does not necessarily mean higher quality workmanship. But if you prefer 18K gold, please call us and ask if the item you are interested in is available in 18K--often it is a stocked (non-custom) item at our supplier, and we can therefore get it for you at a significant savings.